Last year we announced a $1.25 million grant to the Nelson Mandela Centre of Memory to help preserve and digitize thousands of archival documents, photographs and videos about Nelson Mandela. Based in Johannesburg, South Africa, the Nelson Mandela Centre of Memory (NMCM) is committed to documenting the life and times of one of the world's greatest statesmen and spreading his story to promote social justice throughout the world. Today, the Mandela archive has become a reality. Along with historians, educationalists, researchers, activists and many others around the world, you can access a wealth of information and knowledge about the life and legacy of this extraordinary African leader. 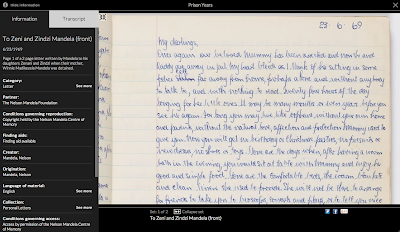 The new online multimedia archive includes Mandela’s correspondence with family, comrades and friends, diaries written during his 27 years of imprisonment, and notes he made while leading the negotiations that ended apartheid in South Africa. The archive will also include the earliest-known photo of Mr. Mandela and never-before seen drafts of Mr. Mandela's manuscripts for the sequel to his autobiography Long Walk to Freedom. We’ve worked closely with the NMCM to create an interactive online experience which we hope will inspire you as much as us. You can search and browse the archives to explore different parts of Mandela’s life and work in depth: Early Life, Prison Years, Presidential Years, Retirement, Books for Mandela, Young People and My Moment with a Legend. For example, you might be interested in Nelson Mandela’s personal memories of the time he was incarcerated and click into the Prison Years exhibit. You can immediately see a curated set of materials threaded together into a broader narrative. These include handwritten notes on his desk calendars, which show, for example, that he met President F.W. De Klerk for the first time on December 13, 1989 for two and a half hours in prison; the Warrants of Committal issued by the Supreme Court which sent him to prison; the earliest known photo of Nelson Mandela’s prison cell on Robben Island circa 1971; and a personal letter written from prison in 1963 to his daughters, Zeni and Zindzi, after their mother was arrested, complete with transcript. From there, you might want to see all the letters held by the archive, and click “See more” in the letters category, where you can discover all personal letters or use the time filter to explore his diaries and calendars written between 1988 and 1998, where you can see that in the last page of the last diary, he met with President Yoweri Kaguta Museveni of Uganda to exchange ideas about the situation in northern Uganda. If you were a researcher, you can search through various fragments of Madiba’s memory that relate to Ahmed Kathrada, his long-time comrade, politician and anti-apartheid activist, where you can find photos, videos, manuscripts and letters that relate to him. Finally, by clicking into the exhibit, My Moment with a Legend, you can go beyond Madiba’s personal materials to get a diverse perspective through photos, videos and stories, via the memories of people like Archbishop Desmond Tutu, F.W. De Klerk and Nomfundo Walaza, a community worker. 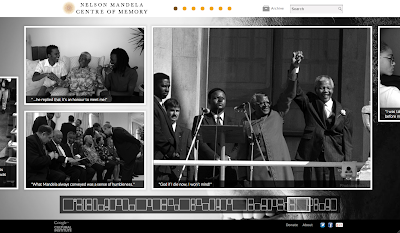 The Nelson Mandela Digital Archive project is an initiative by the Nelson Mandela Centre of Memory and the Google Cultural Institute, which helps to preserve and promote our diverse cultural and historical heritage. Some of our other initiatives include the Art Project, digitizing the Dead Sea Scrolls and bringing the Yad Vashem Holocaust materials online. 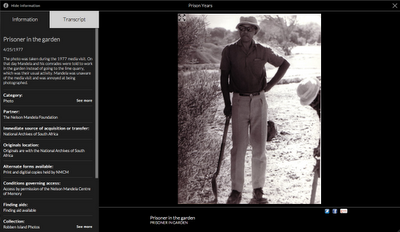 You can start exploring the Nelson Mandela archive right now at archive.nelsonmandela.org. We hope you’ll be inspired by this influential leader—the face of South Africa’s transition to democracy.